EACH of the four primary elements as taught by the early philosophers has its analogue in the quaternary terrestrial constitution of man. The rocks and earth correspond to the bones and flesh; the water to the various fluids; the air to the gases; and the fire to the bodily heat. Since the bones are the framework that sustains the corporeal structure, they may be regarded as a fitting emblem of the spirit--that divine foundation which supports the composite fabric of mind, soul, and body. To the initiate, the skeleton of death holding in bony fingers the reaper's scythe denotes Saturn (Kronos), the father of the gods, carrying the sickle with which he mutilated Ouranos, his own sire. In the language of the Mysteries, the spirits of men are the powdered bones of Saturn. The latter deity was always worshiped under the symbol of the base or footing, inasmuch as he was considered to be the substructure upholding creation. The myth of Saturn has its historical basis in the fragmentary records preserved by the early Greeks and Phœnicians concerning a king by that name who ruled over the ancient continent of Hyperborea. Polaris, Hyperborea, and Atlantis, because they lie buried beneath the continents and oceans of the modern world, have frequently been symbolized as rocks supporting upon their broad surfaces new lands, races, and empires. According to the Scandinavian Mysteries, the stones and cliffs were formed from the bones of Ymir, the primordial giant of the seething clay, while to the Hellenic mystics the rocks were the bones of the Great Mother, Gæa. After the deluge sent by the gods to destroy mankind at the close of the Iron Age, only Deucalion and Pyrrha were left alive. Entering a ruined sanctuary to pray, they were directed by an oracle to depart from the temple and with heads veiled and garments unbound cast behind them the bones of their mother. Construing the cryptic message of the god to mean that the earth was the Great Mother of all creatures, Deucalion picked up loose rocks and, bidding Pyrrha do likewise, cast them behind him. From these rocks there sprang forth a new and stalwart race of human beings, the rocks thrown by Deucalion becoming men and those thrown by Pyrrha becoming women. In this allegory is epitomized the mystery of human evolution; for spirit, by ensouling matter, becomes that indwelling power which gradually but sequentially raises the mineral to the status of the plant; the plant to the plane of the animal; the animal to the dignity of man; and man to the estate of the gods. The solar system was organized by forces operating inward from the great ring of the Saturnian sphere; and since the beginnings of all things were under the control of Saturn, the most reasonable inference is that the first forms of worship were dedicated to him and his peculiar symbol--the stone. Thus the intrinsic nature of Saturn is synonymous with that spiritual rock which is the enduring foundation of the Solar Temple, and has its antitypc or lower octave in that terrestrial rock--the planet Earth--which sustains upon its jagged surface the diversified genera of mundane life. Although its origin is uncertain, litholatry undoubtedly constitutes one of the earliest forms of religious expression. "Throughout all the world, " writes Godfrey Higgins, "the first object of Idolatry seems to have been a plain, unwrought stone, placed in the ground, as an emblem of the generative or procreative powers of nature." (See The Celtic Druids.) Remnants of stone worship are distributed over the greater part of the earth's surface, a notable example being the menhirs at Carnac, in Brittany, where several thousand gigantic uncut stones are arranged in eleven orderly rows. Many of these monoliths stand over twenty feet out of the sand in which they are embedded, and it has been calculated that some of the larger ones weigh as much as 250,000 pounds. By some it is believed that certain of the menhirs mark the location of buried treasure, but the most plausible view is that which regards Carnac as a monument to the astronomical knowledge of antiquity. Scattered throughout the British Isles and Europe, these cairns, dolmens, menhirs, and cistvaens stand as mute but eloquent testimonials to the existence and achievements of races now extinct. Of particular interest are the rocking or logan stones, which evince the mechanical skill of these early peoples. These relics consist of enormous boulders poised upon one or two small points in such a manner that the slightest pressure will sway them, but the greatest effort is not sufficient to overthrow them. These were called living stones by the Greeks and Latins, the most famous one being the Gygorian stone in the Strait of Gibraltar. Though so perfectly balanced that it could be moved with the stalk of a daffodil, this rock could not be upset by the combined weight of many men. There is a legend that Hercules raised a rocking stone over the graves of the two sons of Boreas whom he had killed in combat. This stone was so delicately poised that it swayed back and forth with the wind, but no application of force could overturn it. A number of logan stones have been found in Britain, traces of one no longer standing having been discovered in Stonehenge. (See The Celtic Druids.) It is interesting to note that the green stones forming the inner ring of Stonehenge are believed to have been brought from Africa. In many cases the monoliths are without carving or inscription, for they undoubtedly antedate both the use of tools and the art of writing. In some instances the stones have been trued into columns or obelisks, as in the runic monuments and the Hindu lingams and sakti stones; in other instances they are fashioned into rough likenesses of the human body, as in the Easter Island statues, or into the elaborately sculptured figures of the Central American Indians and the Khmers of Cambodia. The first rough-stone images can hardly be considered as effigies of any particular deity but rather as the crude effort of primitive man to portray in the enduring qualities of stone the procreative attributes of abstract Divinity. An instinctive recognition of the stability of Deity has persisted through all the intervening ages between primitive man and modem civilization. Ample proof of the survival of litholatry in the Christian faith is furnished by allusions to the rock of refuge, the rock upon which the church of Christ was to be founded, the corner stone which the builders rejected, Jacob's stony pillow which he set up and anointed with oil, the sling stone of David, the rock Moriah upon which the altar of King Solomon's Temple was erected, the white stone of Revelation, and the Rock of Ages. Stones were highly venerated by prehistoric peoples primarily because of their usefulness. Jagged bits of stone were probably man's first weapons; rocky cliffs and crags constituted his first fortifications, and from these vantage points he hurled loose boulders down upon marauders. In caverns or rude huts fashioned from slabs of rock the first humans protected themselves from the rigors of the elements. Stones were set up as markers and monuments to primitive achievement; they were also placed upon the graves of the dead, probably as a precautionary measure to prevent the depredations of wild beasts. During migrations, it was apparently customary for primitive peoples to carry about with them stones taken from their original habitat. As the homeland or birthplace of a race was considered sacred, these stones were emblematic of that universal regard shared by all nations for the place of their geniture. The discovery that fire could be produced by striking together two pieces of stone augmented man's reverence for stones, but ultimately the hitherto unsuspected world of wonders opened by the newly discovered element of fire caused pyrolatry to supplant stone worship. The dark, cold Father--stone--gave birth out of itself to the bright, glowing Son-fire; and the newly born flame, by displacing its parent, became the most impressive and mysterious of all religio-philosophic symbols, widespread and enduring through the ages. SATURN SWALLOWING THE STONE SUBSTITUTED FOR JUPITER. From Catrari's Imagini degli Dei degli Antichi. Saturn, having been warned by his parents that one of his own children would dethrone him, devoured each child at birth. At last Rhea, his wife, in order to save Jupiter, her sixth child substituted for him a rock enveloped in swaddling clothes--which Saturn, ignorant of the deception practiced upon him, immediately swallowed. Jupiter was concealed on the island of Crete until he attained manhood, when he forced his father to disgorge the five children he had eaten. The stone swallowed by Saturn in lieu of his youngest son was placed by Jupiter at Delphi, where it was held in great veneration and was daily anointed. The body of every thing was likened to a rock, trued either into a cube or more ornately chiseled to form a pedestal, while the spirit of everything was likened to the elaborately carved figure surmounting it. Accordingly, altars were erected as a symbol of the lower world, and fires were kept burning upon them to represent that spiritual essence illuminating the body it surmounted. The square is actually one surface of a cube, its corresponding figure in plane geometry, and its proper philosophic symbol. Consequently, when considering the earth as an element and not as a body, the Greeks, Brahmins, and Egyptians always referred to its four corners, although they were fully aware that the planet itself was a sphere. Because their doctrines were the sure foundation of all knowledge and the first step in the attainment of conscious immortality, the Mysteries were often represented as cubical or pyramidal stones. Conversely, these stones themselves became the emblem of that condition of self-achieved godhood. The unchangeability of the stone made it an appropriate emblem of God--the immovable and unchangeable Source of Existence--and also of the divine sciences--the eternal revelation of Himself to mankind. As the personification of the rational intellect, which is the true foundation of human life, Mercury, or Hermes, was symbolized in a like manner. 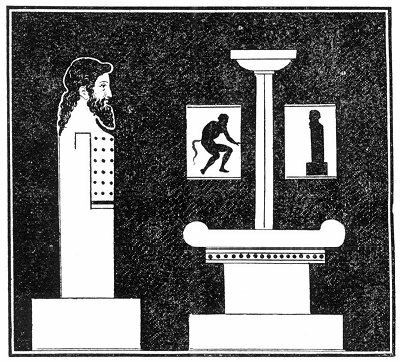 Square or cylindrical pillars, surmounted by a bearded head of Hermes and called hermæ, were set up in public places. 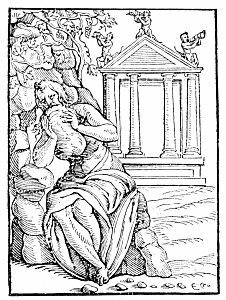 Terminus, a form of Jupiter and god of boundaries and highways, from whose name is derived the modern word terminal, was also symbolized by an upright stone, sometimes ornamented with the head of the god, which was placed at the borders of provinces and the intersections of important roads. The philosopher's stone is really the philosophical stone, for philosophy is truly likened to a magic jewel whose touch transmutes base substances into priceless gems like itself. Wisdom is the alchemist's powder of projection which transforms many thousand times its own weight of gross ignorance into the precious substance of enlightenment. 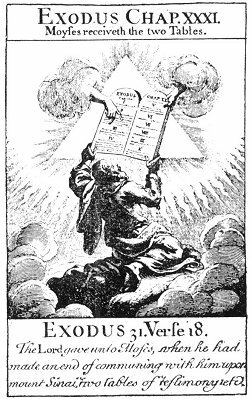 The Ten Commandments are the ten shining gems placed by the Holy One in the sapphire sea of Being, and in the depths of matter the reflections of these jewels are seen as the laws governing the sublunary spheres. They are the sacred ten by which the Supreme Deity has stamped His will upon the face of Nature. This same decad was celebrated by the Pythagoreans under the form of the tetractys--that triangle of spermatic points which reveals to the initiated the whole working of the cosmic scheme; for ten is the number of perfection, the key to creation, and the proper symbol of God, man, and the universe. Because of the idolatry of the Israelites, Moses deemed the people unworthy to receive the sapphire tables; hence he destroyed them, that the Mysteries of Jehovah should not be violated. For the original set Moses substituted two tablets of rough stone into the surface of which he had cut ten ancient letters. 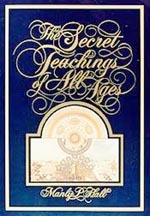 While the former tables--partaking of the divinity of the Tree of Life--blazed forth eternal verities, the latter--partaking of the nature of the Tree of Good and Evil--revealed only temporal truths. Thus the ancient tradition of Israel returned again to heaven, leaving only its shadow with the children of the twelve tribes. One of the two tables of stone delivered by the Lawgiver to his followers stood for the oral, the other for the written traditions upon which the Rabbinical School was founded. Authorities differ widely as to the size and substance of the inferior tables. Some describe them as being so small that they could be held in the hollow of a man's hand; others declare that each table was ten or twelve cubits in length and of enormous weight. A few even deny that the tables were of stone, maintaining that they were of a wood called sedr, which, according to the Mohammedans, grows profusely in Paradise. The two tables signify respectively the superior and the inferior worlds--the paternal and the maternal formative principles. In their undivided state they represent the Cosmic Androgyne. The breaking of the tables signifies obscurely the separation of the superior and the inferior spheres and also the division of the sexes. In the religious processionals of the Greeks and Egyptians an ark or ship was carried which contained stone tablets, cones, and vessels of various shapes emblematic of the procreative processes. The Ark of the Israelites--which was patterned after the sacred chests of the Isiac Mysteries--contained three holy objects, each having an important phallic interpretation: the pot of manna, the rod that budded, and the Tablets of the Law--the first, second, and third Principles of the Creative Triad. The manna, the blossoming staff, and the stone tables are also appropriate images respectively of the Qabbalah, the Mishna, and the written law--the spirit, soul, and body of Judaism. When placed in King Solomon's Everlasting House, the Ark of the Covenant contained only the Tablets of the Law. Does this indicate that even at that early date the secret tradition had been lost and the letter of the revelation alone remained? As representing the power that fabricated the lower, or Demiurgic, sphere, the tablets of stone were sacred to Jehovah in contradistinction to the tablets of sapphire that signified the potency that established the higher, or celestial, sphere. Without doubt the Mosaic tablets have their prototype in the stone pillars or obelisks placed on either side of the entrance to pagan temples. These columns may pertain to that remote time when men worshiped the Creator through His zodiacal sign of Gemini, the symbol of which is still the phallic pillars of the Celestial Twins. "The Ten Commandments, writes Hargrave Jennings, "are inscribed in two groups of five each, in columnar form. The five to the right (looking from the altar) mean the 'Law'; the five to the left mean the 'Prophets.' The right stone is masculine, the left stone is feminine. They correspond to the two disjoined pillars of stone (or towers) in the front of every cathedral, and of every temple in the heathen times." 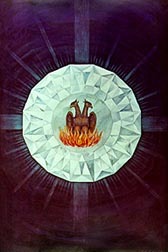 (See The Rosicrucians: Their Rites and Mysteries.) The same author states that the Law is masculine because it was delivered direct from the Deity, while the Prophets, or Gospels, were feminine because born through the nature of man. The right Tablet of the Law further signifies Jachin--the white pillar of light; the left Tablet, Boaz--the shadowy pillar of darkness. These were the names of the two pillars cast from brass set up on the porch of King Solomon's Temple. They were eighteen cubits in height and beautifully ornamented with wreaths of chainwork, nets, and pomegranates. On the top of each pillar was a large bowl--now erroneously called a ball or globe--one of the bowls probably containing fire and the other water. The celestial globe (originally the bowl of fire), surmounting the right-hand column (Jachin), symbolized the divine man; the terrestrial globe (the bowl of water), surmounting the left-hand column (Boaz), signified the earthly man. These two pillars respectively connote also the active and the passive expressions of Divine Energy, the sun and the moon, sulphur and salt, good and bad, light and darkness. Between them is the door leading into the House of God, and standing thus at the gates of Sanctuary they are a reminder that Jehovah is both an androgynous and an anthropomorphic deity. As two parallel columns they denote the zodiacal signs of Cancer and Capricorn, which were formerly placed in the chamber of initiation to represent birth and death--the extremes of physical life. They accordingly signify the summer and the winter solstices, now known to Freemasons under the comparatively modern appellation of the "two St. Johns." MOSES RECEIVING THE TABLES OF THE LAW. Moses Maimonides, the great Jewish Philosopher of the twelfth century, in describing the Tables of the Law written by the finger of God, divides all productions into two general orders: products of Nature and products of art. God works through Nature and man through art, he asserts in his Guide for the Perplexed. Thus the Word of the Lord is the hand, or active principle, by which the will of the Creator is traced upon the face of His creation. The Tannaim, or initiates of the Jewish Mystery School, alone possessed a complete understanding of the significance of the Ten Commandments. These laws are esoterically related to the ten degrees of contemplation constituting the Path of Ecstasy, which winds upward through he four worlds and ends in the effulgence of AIN SOPH. [paragraph continues] My House be established. "In the splendor of mental and spiritual illumination, the High Priest stood between the pillars as a mute witness to the perfect virtue of equilibrium--that hypothetical point equidistant from all extremes. He thus personified the divine nature of man in the midst of his compound constitution--the mysterious Pythagorean Monad in the presence of the Duad. On one side towered the stupendous column of the intellect; on the other, the brazen pillar of the flesh. Midway between these two stands the glorified wise man, but he cannot reach this high estate without first suffering upon the cross made by joining these pillars together. The early Jews occasionally represented the two pillars, Jachin and Boaz, as the legs of Jehovah, thereby signifying to the modern philosopher that Wisdom and Love, in their most exalted sense, support the whole order of creation--both mundane and supermundane. Like the sapphire Schethiyâ, the Lapis Exilis, crown jewel of the Archangel Lucifer, fell from heaven. Michael, archangel of the sun and the Hidden God of Israel, at the head of the angelic hosts swooped down upon Lucifer and his legions of rebellious spirits. During the conflict, Michael with his flaming sword struck the flashing Lapis Exilis from the coronet of his adversary, and the green stone fell through all the celestial rings into the dark and immeasurable Abyss. Out of Lucifer's radiant gem was fashioned the Sangreal, or Holy Grail, from which Christ is said to have drunk at the Last Supper. No adequate interpretation has ever been given to the Grail Mysteries. Some believe the Knights of the Holy Grail to have been a powerful organization of Christian mystics perpetuating the Ancient Wisdom under the rituals and sacraments of the oracular Cup. The quest for the Holy Grail is the eternal search for truth, and Albert G. Mackey sees in it a variation of the Masonic legend of the Lost Word so long sought by the brethren of the Craft. There is also evidence to support the claim that the story of the Grail is an elaboration of an early pagan Nature myth which has been preserved by reason of the subtle manner in which it was engrafted upon the cult of Christianity. From this particular viewpoint, the Holy Grail is undoubtedly a type of the ark or vessel in which the life of the world is preserved and therefore is significant of the body of the Great Mother--Nature. Its green color relates it to Venus and to the mystery of generation; also to the Islamic faith, whose sacred color is green and whose Sabbath is Friday, the day of Venus. The Holy Cup can be discovered only by those who have raised themselves above the limitations of sensuous existence. In his mystic poem, The Vision of Sir Launfal, James Russell Lowell discloses the true nature of the Holy Grail by showing that it is visible only to a certain state of spiritual consciousness. Only upon returning from the vain pursuit of haughty ambition did the aged and broken knight see in the transformed leper's cup the glowing chalice of his lifelong dream. Some writers trace a similarity between the Grail legend and the stories of the martyred Sun Gods whose blood, descending from heaven into the earth, was caught in the cup of matter and liberated therefrom by the initiatory rites. The Holy Grail may also be the seed pod so frequently employed in the ancient Mysteries as an emblem of germination and resurrection; and if the cuplike shape of the Grail be derived from the flower, it signifies the regeneration and spiritualization of the generative forces in man. There are many accounts of stone images which, because of the substances entering into their composition and the ceremonials attendant upon their construction, were ensouled by the divinities whom they were created to resemble. To such images were ascribed various human faculties and powers, such as speech, thought, and even motion. While renegade priests doubtless resorted to trickery--an instance of which is related in a curious apocryphal fragment entitled Bel and the Dragon and supposedly deleted from the end of the Book of Daniel--many of the phenomena recorded in connection with sanctified statues and relics can hardly be explained unless the work of supernatural agencies be admitted. Divination by stones was often resorted to by the Greeks, and Helena is said to have foretold by lithomancy the destruction of Troy. Many popular superstitions about stones survive the so-called Dark Ages. Chief among these is the one concerning the famous black stone in the seat of the coronation chair in Westminster Abbey, which is declared to be the actual rock used by Jacob as a pillow. The black stone also appears several times in religious symbolism. It was called Heliogabalus, a word presumably derived from Elagabal, the Syro-Phœnician sun god. This stone was sacred to the sun and declared to possess great and diversified properties. The black stone in the Caaba at Mecca is still revered throughout the Mohammedan world. It is said to have been white originally and of such brilliancy that it could be seen many days' journey from Mecca, but as ages passed it became blackened by the tears of pilgrims and the sins of the world. From Christie's Disquisitions upon the Painted Greek Vases. The Primitive custom of worshiping the gods in the form of heaps of stones gave place to the practice of erecting phallic pillars, or cones, in their honor. These columns differed widely in size and appearance. Some were of gigantic proportions and were richly ornamented with inscriptions or likenesses of the gods and heroes; others--like the votive offerings of the Babylonians--were but a few inches high, without ornament, and merely bore a brief statement of the purpose for which they had been prepared or a hymn to the god of the temple in which they were placed. These small baked clay cones were identical in their symbolic meaning with the large hermæ set up by the roadside and in other public places. Later the upper end of the column was surmounted by a human head. Often two projections, or tenons, corresponding to shoulders were placed, one on either side, to support the wreaths of flowers adorning the columns. Offerings, usually of food, were placed near the hermæ. Occasionally these columns were used to uphold roofs and were numbered among the art objects ornamenting the villas of wealthy Romans. will prove to be the metal of Uranus and radium to be the metal of Neptune. The ring has long been regarded as the symbol of attainment, perfection, and immortality-the last because the circlet of precious metal had neither beginning nor end. In the Mysteries, rings chased to resemble a serpent with its tail in its mouth were worn by the initiates as material evidence of the position reached by them in the order. Signet rings, engraved with certain secret emblems, were worn by the hierophants, and it was not uncommon for a messenger to prove that he was the official representative of a prince or other dignitary by bringing with his message either an impression from his master's ring or the signet itself. The wedding ring originally was intended to imply that in the nature of the one who wore it the state of equilibrium and completion had been attained. This plain band of gold therefore bore witness of the union of the Higher Self (God) with the lower self (Nature) and the ceremony consummating this indissoluble blending of Divinity and humanity in the one nature of the initiated mystic constituted the hermetic marriage of the Mysteries. Both the magic mirror and the crystal ball are symbols little understood. Woe to that benighted mortal who accepts literally the stories circulated concerning them! He will discover--often at the cost of sanity and health--that sorcery and philosophy, while often confused, have nothing in common. The Persian Magi carried mirrors as an emblem of the material sphere which reflects Divinity from its every part. The crystal ball, long misused as a medium for the cultivation of psychical powers, is a threefold symbol: (1) it signifies the crystalline Universal Egg in whose transparent depths creation exists; (2) it is a proper figure of Deity previous to Its immersion in matter; (3) it signifies the ætheric sphere of the world in whose translucent essences is impressed and preserved the perfect image of all terrestrial activity. Meteors, or rocks from heaven, were considered tokens of divine favor and enshrined as evidence of a pact between the gods and the community in which they fell. Curiously marked or chipped natural stones are occasionally found. In China there is a slab of marble the grain of which forms a perfect likeness of the Chinese dragon. The Oberammergau stone, chipped by Nature into a close resemblance to the popular conception of the face of Christ, is so remarkable that even the crowned heads of Europe requested the privilege of beholding it. Stones of such nature were held in the highest esteem among primitive peoples and even today exert a wide influence upon the religiously-minded. From Cartari's Imagini degli Dei degli Antichi. The number five was peculiarly associated by the Pythagoreans with the art of healing, and the pentagram, or five-pointed star, was to them the symbol of health. 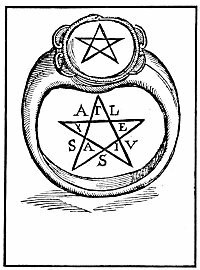 The above figure represents a magical ring set with a talismanic gem bearing the pentalpha, or star formed by five different positions of the Greek Alpha. On this subject Mackey writes: "The disciples of Pythagoras, who were indeed its real inventors, placed within each of its interior angles one of the letters of the Greek word ΥΓΕΙΑ, or the Latin one SALUS, both of which signify health; and thus it was made the talisman of health. They placed it at the beginning of their epistles as a greeting to invoke a secure health to their correspondent. But its use was not confined to the disciples of Pythagoras. As a talisman, it was employed all over the East as a charm to resist evil spirits."